The Institute houses a unique collection of paper squeezes of inscriptions (particularly milestones) from all over Turkey. This collection was assembled largely by David French and in many cases the original stone inscriptions are lost or destroyed so that the squeezes form the only surviving evidence. 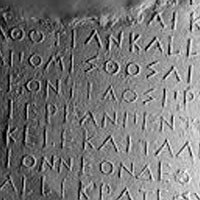 The inscriptions are mainly in Greek. An electronic catalogue accompanies the squeezes. Agonistic Alliance Text Anagram Boundary Stone Building Inscription Capital Celebratory Christian Inscription Christian Prayer Church Civic Civic Decree Civic Honour Civic Work Decree Dedication Dedication to City Dedication to Emperor Funerary Funerary? Gladiatorial List Greek Civic Public Inscription Hellenistic Royal Letter Honorific Honorific Dedication Imperial Construction Imperial Dedication Imperial Honorific Imperial Name Imperial Rescript List of Names Milestone Military Other Roman Goverment or imperial Inscription Roman Military Text Roman official Stadion-Stone Storage Jar Sundial Temenos Marker Tile Uncertain Unidentified Unit Verse Votive Votive?